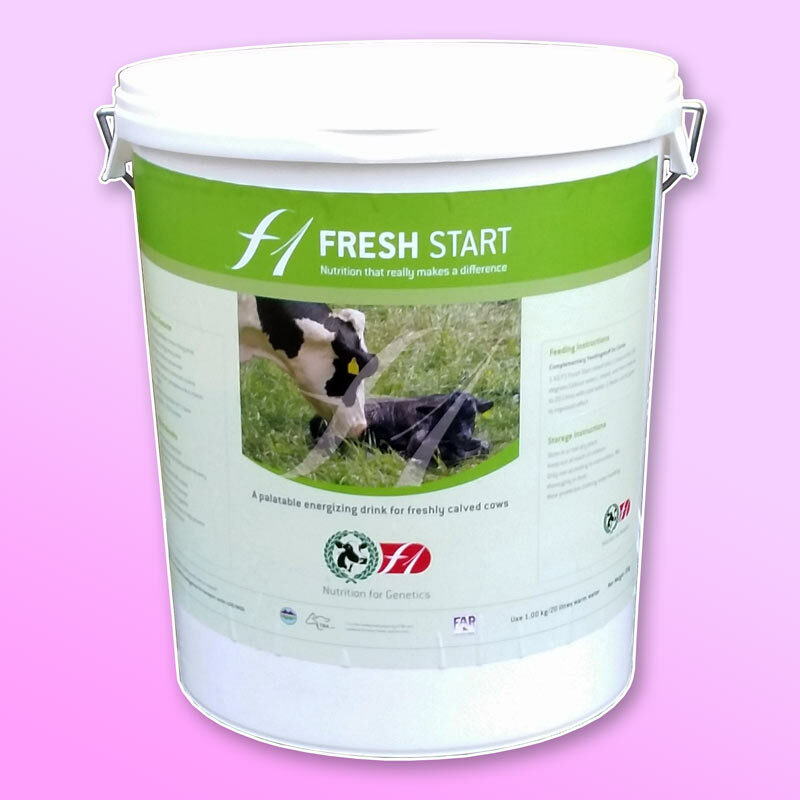 F1 Fresh Start is a freshly-calved cow rehydrating formulation designed to promote a good appetite immediately post-calving. F1 Fresh Start also provides the animal with a boosting dose of Calcium, Glucose and Electrolytes. We include foundation doses of Active Yeast and liver-conditioning agents in order to promote improved rumen and liver function. Mix 1 Kg with 2 litres of hot (65 degrees celcius) water, mix until bright orange and then make up to 20-30 litres with cool water. Present to the fresh-calved cow within ten to fifteen minutes of her calving. She will drink this elixir readily in most cases. This treatment also helps to provide displaced abomasums by helping the rumen volume to fill the space vacated by the foetus post-calving very rapidly. This in itself helps to promote a healthy appetite very soon after calving. F1 Fresh Start is fortified with protected Methionine and Choline in order to aid liver function. We recommend the use of LF Transition for three weeks prior to calving in order to prepare the liver for higher levels of activity at the start of lactation. LF Transition contains protected Methionine and Choline as well as Niacin which are known to be effective in this respect. F1 Fresh Start also contains a dose of highly soluble Calcium. Whilst we do not claim that this will prevent Milk Fever it will certainly be a positive step in it’s prevention. We are able to deliver three 15Kg buckets of F1 Fresh Start across mainland UK, except Scotland north of Inverness.